Hectare urbain has won the Projets d’espoir award in the University category from the Fondation Monique-Fitz-Back. The competition, launched to mark the foundation’s 10th anniversary, recognizes inspiring educational initiatives in the area of sustainable development. A total of 67 projects carried out in recent years were submitted to the foundation by institutions at all levels, ranging from pre-school to university. The competition jury was chaired by Laure Waridel, Executive Director of the Interdisciplinary Research Centre on Sustainable Development Operationalization (CIRODD). Hectare urbain is an urban agriculture project with a focus on sustainable development and encouraging people to think about food chain issues, climate change and how we can preserve biodiversity. The project includes a permaculture forest garden, four patio gardens, and a green space on the roof of the Côte-Sainte-Catherine building. Extracurricular workshops, training sessions, lectures and field activities are also part of the project. Lastly, a new initiative is being launched in 2016: sponsoring local schools to introduce their students to permaculture. The mission of the Fondation Monique-Fitz-Back is to promote environmental and healthy lifestyle education from a sustainable development perspective. 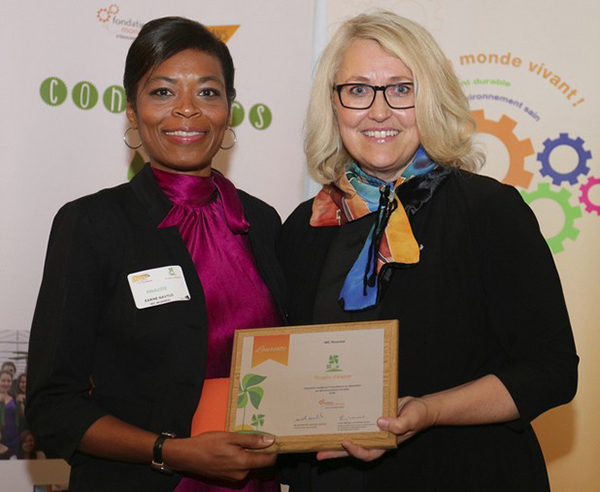 On the photo: Karine Navilys (Coordinator, Office of Sustainable Development, HEC Montréal) et Pauline D’Amboise (Secretary General and Vice-President Governance and Social Responsibility, Desjardins). Photo credit: Martine Lapointe.